As I mentioned before, our two youngest (7 and 5.5) are finally enjoying audio stories, which make car rides much smoother! They will now happily listen quietly while we’re driving. Woo hoo! Recently, we were offered the chance to review The Brinkman Adventures: Season 3, and I jumped on it. 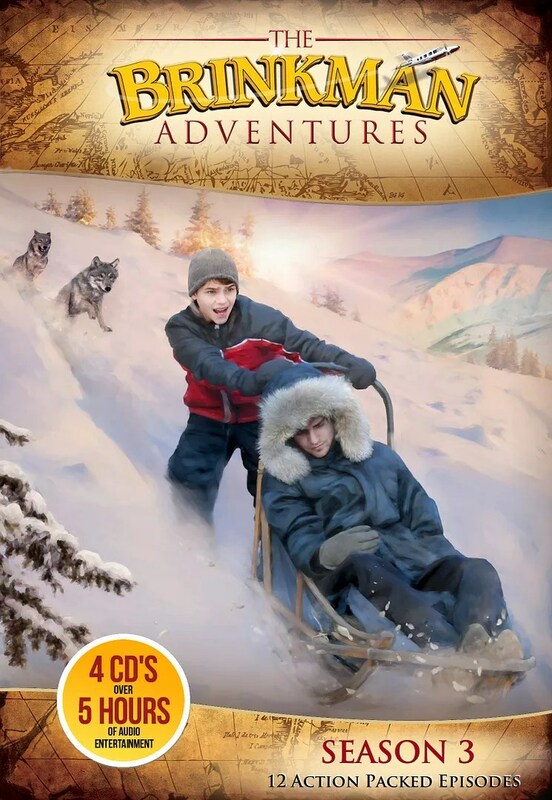 Last year we had also reviewed a Brinkman Adventures season, and my son really enjoyed it, though the other two were too young. Now, I thought, they are old enough to ALL enjoy it. Luckily, I was right. The Brinkman Adventures: Season 3 is full of several short stories that all interconnect in some way. Destinations range from Africa to India to Alaska to Ecuador. While the Brinkmans, a missionary faamily with many children, remain the focus of the stories, several stories in this season focus on others that the Brinkmans interact with in some ways. There are four CDs in Season 3 with over five hours of story telling! This season truly is brimming with adventure! One of the stories focuses on missionaries who are being pursued by the Taliban. Another focuses on a man who is delivering Bibles and could die for doing so. Yet, each time, as he and his volunteers smuggle in more and more Bibles, they’re able to escape undetected. There’s another story about a shy young girl who eventually becomes a national spokesperson for Operation Christmas Child. There are also several more exciting stories! We received a physical copy of Season 3, and we listened to the adventures in the car over the course of two weeks while we drove to drop my husband at his bus stop, to homeschool activities, etc. My kids are like most kids. They’re noisy in the car and fight and bicker occasionally, but when The Brinkman Adventures were on, they were q.u.i.e.t.! The only time they made a noise was if they didn’t understand what was happening and had to ask for clarification. They were also routinely disappointed when we reached our destination and had to turn off the show. More often than not, we seemed to have to stop at a dramatic, action-filled moment, but since so much of this story is action-packed, that happened quite often! As soon as we were back in the car, the kids begged to listen again. Bookworm (11) especially liked that each new episode started in the middle of the story. That made him more engaged and excited to hear what would happen next. The kids also enjoyed the little bits of everyday humor that is included. For instance, one of the youngest Brinkman children gets a glass of water from the toilet and serves it to someone. Also, the Brinkmans get a call while they’re gone that one of their children is stuck on the roof. Overall, our family really enjoyed this season! In fact, we enjoyed it so much, I’m thinking of buying the first and second seasons on CD so we can listen to them when we make the long car ride to Michigan to visit family. However, we did have some minor dislikes. While Bookworm liked that the stories seemed to start right in the middle, the kids and I didn’t initially know what was going on. This lead to frustration on the younger kids’ part, but we learned that if we just patiently listened to the story, we’d understand sooner or later. Because this is audio only, keeping all of the people straight can be difficult. Finally, the stories are filled with music that builds suspense and sets the mood, which is wonderful. However, sometimes the music could be very loud, but the actual conversation that immediately follows is much quieter, so I found myself adjusting the volume quite often. I was one of 85 reviewers to review The Brinkman Adventures: Season 3. To read more reviews, click on the link below.